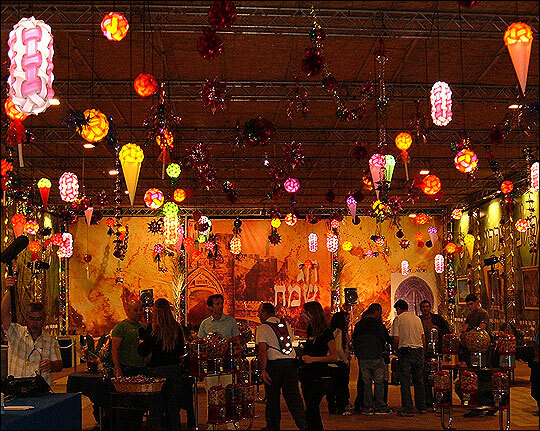 Sukkot Festival Especially Sweet in Jerusalem The week-long Jewish festival of Sukkot begins Wednesday. Jerusalem decided to sweeten the tradition by building a hut with some unlikely materials — gum and candy. 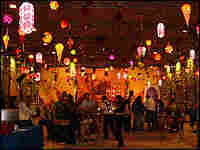 In this sukka, pillars display a rainbow-colored collection of sweet things and glowing candy-shaped lights. The week-long joyous festival of Sukkot, or Tabernacles, which celebrates Jewish history and agriculture, begins Wednesday night. Jews around the world build small huts, similar to the temporary shelters in the desert where their ancestors lived after the exodus from Egypt — and on their way to the promised land. During the holiday, Orthodox Jews eat and sleep in the huts, which are usually built of sheets of metal or wood. But in Jerusalem, a different kind of hut, or sukka, has been constructed. A huge sukka made partly out of candy has been built by the city in a large plaza. At the entrance, two hollow, clear, plastic pillars are filled with a rainbow of colored bubble gum, chewy toffees and lollipops. Inside, two cotton candy machines turn out wispy cones of sugar in pink and blue. The lights on the ceiling are shaped like candy and banks of candy machines spill jelly beans and gum into small eager hands. 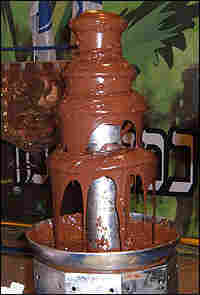 Mayor Uri Lupolianski mans the chocolate fountain. He dips marshmallows on sticks into the warm cascading chocolate and hands them over to excited children. He says the idea is to make Jerusalem's children happy over the holiday. "Here we have, thank God, the biggest sukka in the world," Lupolianski says. "We invite all the children with their parents to come to the municipality sukka and to [be] happy with the candy and everything that is sweet." It certainly seems to be working. Elisheva Lipner, 11, is grins from ear to ear. "They should have it more often," Lipner says. She says the best part of the celebration is the candy and she wants her parents to build a hut just like this at home. It's also a hit with tourists like Alex Eidelman from Boston. "It's great. I'm visiting here for a few months and it's nice to be able to connect with something the city's actually doing," Eidelman says. "So I'm really enjoying it and, of course, there's cotton candy, which is a big plus." Jerusalem city officials say they expect to give away close to two tons of candy during the week-long holiday. There's been no comment yet from Israel's dentists.